Cuddl Duds started its business in 1970, building their legacy on warm layering that’s cozy and comfy without unnecessary bulk. From fabric to fit, the company takes pride in quality sourcing and incorporating leading textile innovations, performance technologies, and modern functions. Historically, Cuddl Duds has not invested heavily in advertising. The company needed a partner who could lead with a consultative, strategic approach and offer a platform of multi-channel opportunities. It was imperative that the media partner understood their business goals and KPIs. In addition to Condé Nast, we partner with 50+ data and media partners to deliver unmatched digital strategy, planning, and buying. Solution: Develop a strategic programmatic program using weather targeting technology, empowering the brand to target audiences at very specific timing. Specific weather condition filters were used. 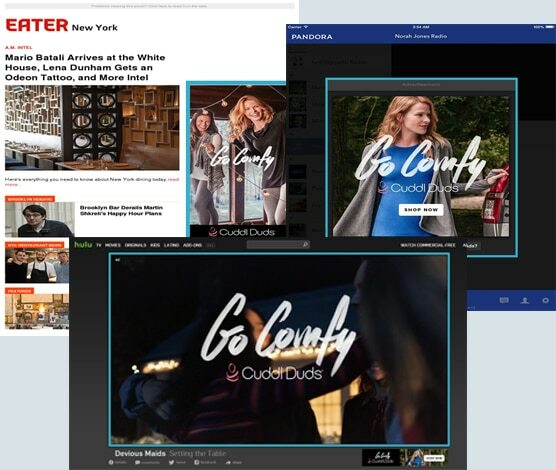 Key Findings: .09% overall CTR and 80% Completion Rate for Pre-Roll Some retailers performed better than others, but the weather targeting was overall much more effective at driving users to the websites. We saw the highest CTRs between 8pm and midnight, which may correspond with weather targeting having such success. Key Findings: The campaign ended with a completion rate of 97.71% for both of their targets along with a .27% CTR for women 18-49 and .23% on 50+ targets. Solution: Execute a campaign utilizing high impact video units in a native, contextually relevant environment. Key Findings: Overall video completion rate of the campaign was 12.98% and a CTR of 1.15%. Approximately 54,000 of the 116,000 were 100 % completed views. Drive high quality traffic to the CuddlDud’s national retailer websites – JC Penney, Kohl’s, Macys, QVC and CuddlDuds. Key Findings: Campaign performed with an overall effective CTR of .37%; highest performing day being 12/4 at .50%. Performance improved month over month with December at an overall .40% CTR. Desktop performed best among all three devices with a CTR of 0.44%. Mobile received the highest number of clicks (6,648). "For such a complex plan, MediaMax totally exceeded expectations both from a delivery and performance standpoint. Their program was a consistent top performer across the campaign and with the diversity of tactics, we were able to take advantage of what really allowed us to spread our brand's name wider ...and in a more impactful way than a typical more standard plan would have."